Giorgos Germenis and Panos Iliopoulos now being held by Police. In another dirty and unconstitutional action from the Samaras “democratic” Junta, Two more of Golden Dawns MPs Giorgos Germenis and Panagiotis Iliopoulos are being detained in an Athenian Police Station now and will be transferred to Korydallos prison in the morning. No evidence has been presented in the case, simply acussations about their ideas. The dirty war of the servants to the memorandum continues, and our party members shall continue to fight both inside and outside the Parliament! Two Golden Dawn lawmakers were placed in pre-trial detention late on Saturday in Athens in an ongoing crackdown against the Greek far right group, court officials said. Giorgos Germenis and Panayiotis Iliopoulos have previously been charged with joining and directing a criminal organisation, officials added. Another politician, Stathis Boukouras, who faces the same charges, also appeared before magistrates but his fate regarding jail will be decided on Sunday. 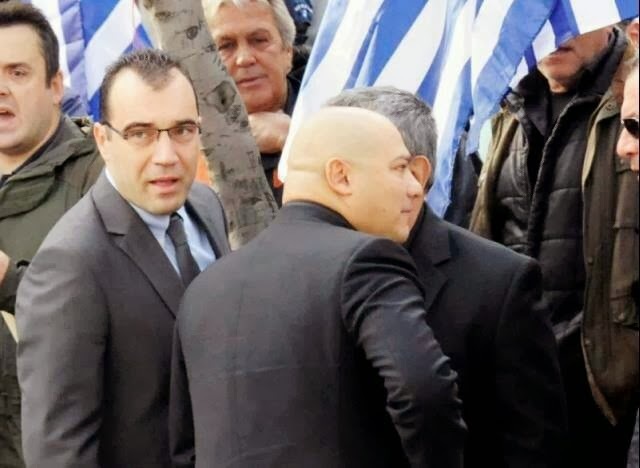 Three other of the 18 Golden Dawn members of parliament, among them the leader Nikos Michaloliakos, are already behind bars. And a further three, including Ilias Kasidiaris, the party spokesman, have already been charged in connection with an investigation prompted by the murder of an anti-fascist musician in September. According to the state-run Athens News Agency (ANA), a witness claimed that Germenis allegedly had the role of an "army major" in the recruitment and training of new members as well as in migrant attacks. All three MPs, who had their parliamentary immunity lifted, denied charges on Saturday, with Iliopoulos claiming that Golden Dawn is not a criminal organisation and that "assault militias don't exist". Around 150 extreme-right supporters, among them Michaloliakos's wife and daughter, chanted slogans and held flags outside the magistrate's office in the afternoon. Ilias Kasidiaris was among them. "The terrorists are walking free," he said referring to the recent escape while on a furlough of far-left militant Christodoulos Xiros, member of the 17 November terrorist organisation. "The hustlers of PASOK and New Democracy are walking freely, not even one MP or minister has been called in for questioning for the scandals and the bribes. The only ones dragged in examinations and illegal imprisonments are Golden Dawn MPs," he added. Golden Dawn announced during a press conference on Friday its intention to challenge the Greek government's crackdown in the European Court of Human Rights. Procedures that led to the jailing of Michaloliakos and other MPs were denounced as "illegal and unconstitutional". The press conference was also attended by MEP Nick Griffin, leader of the British National Party, who pledged his support for the Golden Dawn party.